Which OS I am using (version number and all, to compare it with the latest available builds)? Which Desktop Environment am I using? If I am using KDE, most of the programs begin with a K and I can say I am using KDE, but there should be some way to query this, say from a script. Basically, what I miss is a single point/utility that can get all this information for me. Most of the times the solutions to the above would themselves be OS specific. Then, you are stuck. Most Desktop Environments like GNOME or KDE have an "about" or "info" menu option that will tell you what you use currently, so no commandline needed there really. As far as the desktop environment question goes, you should be able to echo $DESKTOP_SESSION in KDE or GNOME and get back the right answer. If you want to find out what distro you're running, a cheater's shortcut is to cat /etc/*-version /etc/*-release. to get information about the kernel version and which OS you are using. To collect an information about a your system in Unix (GNU/Linux) you need known several useful commands. A name of desktop environment keeping in the environment variable "DESKTOP_SESSION". But if the environment variable "DESKTOP_SESSION" is "default" (as in my case), try getting a value from the environment variable "XDG_CURRENT_DESKTOP". For detect a version of desktop environment you need more efforts, because there has not built-in utilities. This command tested only my computer with the Gnome shell, but must work with other popular graphical desktop environment: KDE, Mate, Cinnamon, LXDE, Xfce. 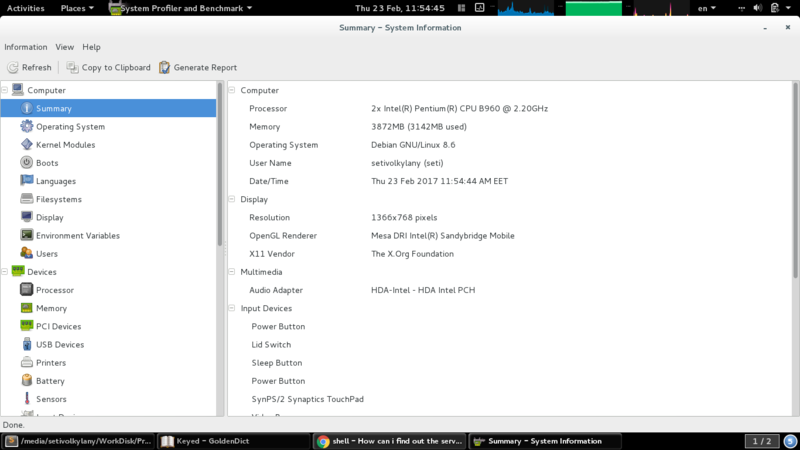 technology of the GNOME 3 user experience. If you need a good tool for similar tasks and more features, I recommend the "HardInfo" - https://github.com/lpereira/hardinfo. 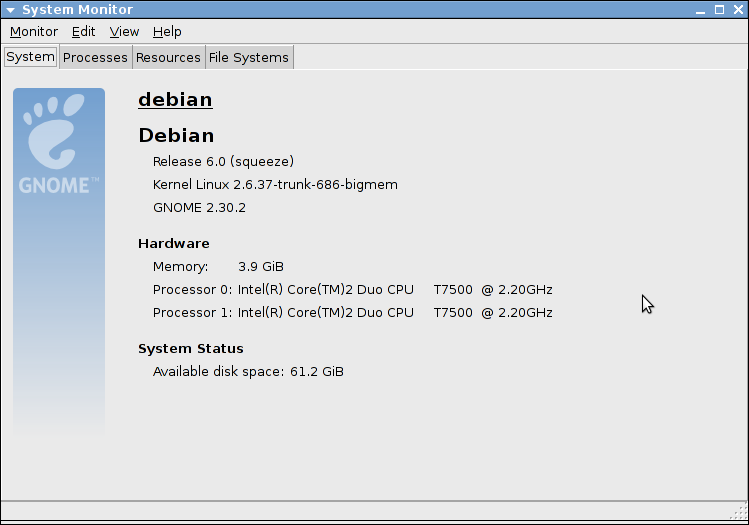 It easy to install in Debian-based systems. Is there a way to retrieve the name of the Desktop Environment? The desktop thing is a little hard because you can have multiple ones installed, and can run one package belonging to one desktop on a different desktop. Also, running printenv DESKTOP_SESSION on my Debian system just outputs default (but it works well on Ubuntu and Fedora). Not the answer you're looking for? Browse other questions tagged kernel desktop-environment system-information or ask your own question. What are the user interface subsystems, their components and responsibilities? Kernel freezes on loading ramdisk. How to find out what's wrong? How to find out what distros are using particular Linux version?